Menu planning for Turkey Day? Add these Thanksgiving roasted Brussels sprouts with bacon, pomegranates, and a balsamic glaze to the lineup! The combination of bright greens and reds is a fantastic way to bring beautiful color to the table. And they taste as yummy as they look. Anything with pomegranates has that effect on me. Speaking of pomegranates, do you know the best and easiest way to open and deseed them? This video has saved my sanity too many times to count! The water trick in particular! My favorite part about this classic Thanksgiving side is the crispy bacon. The saltiness and crunch pairs perfectly with the tart flavor of the pomegranates, and the earthy taste of the Brussels sprouts. It feels a little bit fancy, but it is incredibly simple to make! You know what’s funny? I used to HATE Brussels sprouts as kid. Thought they were the devil’s vegetable, but I’ve had a change of heart! I’m a lowly, repentant vegetable eater now! The smell of Brussels sprouts roasting in the oven is heaven to my nostrils. The Best Part of These Thanksgiving Roasted Brussels Sprouts? Check out my other Thanksgiving recipes here (especially our one bowl Thanksgiving fruit salad recipe)! 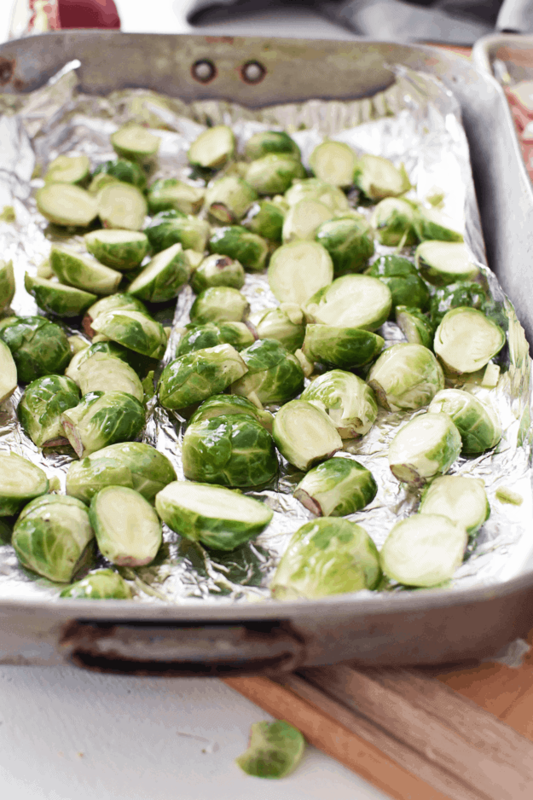 Grab the recipe to these Thanksgiving roasted Brussels sprouts below and enjoy! 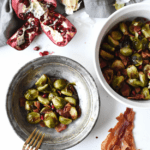 These Thanksgiving roasted Brussels sprouts with bacon are a beautiful side dish to you must serve. Prep them in under 15 minutes, and let the oven do the rest. Wash and dry Brussels sprouts. Cut them in half, and place in a baking dish lined with foil. Add in the garlic and drizzle olive oil and salt all over. Mix lightly with hands. Cover a baking sheet with foil. Line the bacon on the sheet. 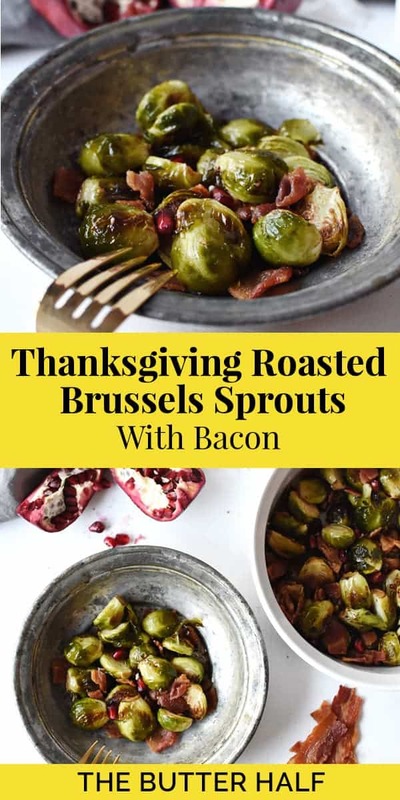 Cook both the Brussels sprouts and bacon on 425°F for 30 minutes. 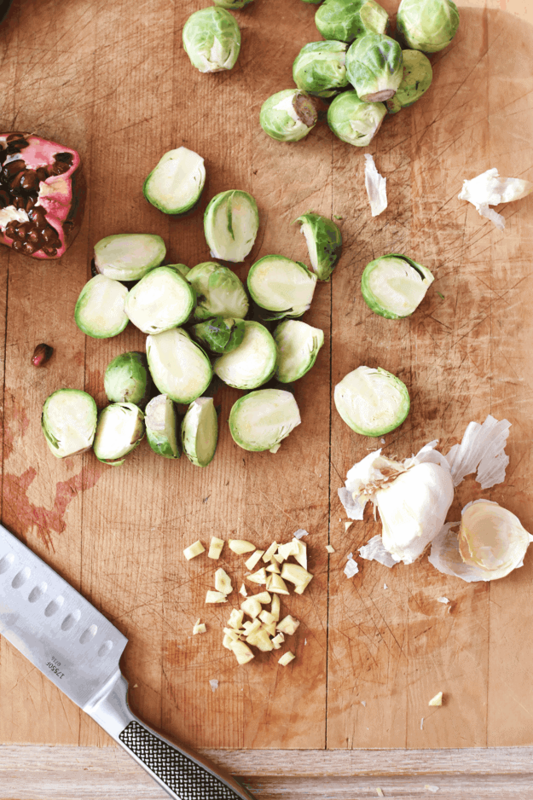 Brussels sprouts should start to crisp and lightly brown on edges, and soften in the middle. Bacon should be crisp. Remove when done and allow both to cool for 5-10 minutes. Chop bacon into small bits. 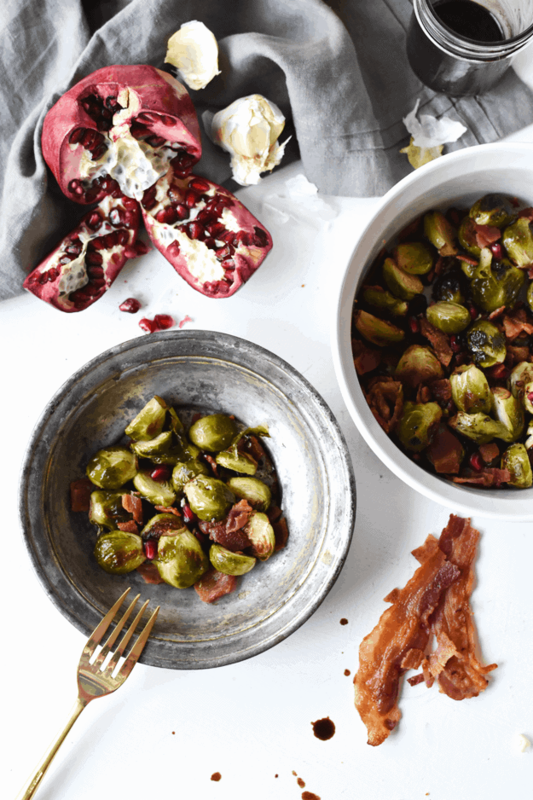 Toss the Brussels sprouts, bacon, and pomegranate seeds together in a large bowl. Drizzle with balsamic vinegar. Serve immediately, or make ahead one day. (If prepping early, omit the pomegranate seeds until ready to serve. Reheat everything in the oven on 325°F for 5-10 minutes until warm, then toss with fresh pomegranate seeds.) Enjoy!